A pet tracker is by far the safest, most reliable, and most convenient solution for keeping track of your pet’s whereabouts and making sure your beloved pal does not get lost. However, not all pet trackers are created equal, with the solutions currently on the market ranging from indispensable to virtually useless. With our ultimate guide to choosing the right pet tracker, you get to learn what you should look for in a pet tracker, discover the absolute best pet trackers available, and easily decide which of our top picks is the best fit for your furry friend. Let us begin with our top list of the best pet trackers. Findster Duo+ is a user-friendly GPS pet tracker with a communication range of up to 3 miles. It can work anywhere as it does not require cellular coverage and it comes with no monthly fees. Garmin Astro 430 is a premium dog tracking system that provides location updates within seconds, tracks up to 20 dogs at once, and has a massive set of both standard and special features. Whistle is a popular GPS tracker and activity monitor for cats and dogs that offers an impressive feature set, great accuracy, and an almost unlimited communication range. Tractive GPS is a GPS pet tracker that works in 150+ world countries. It lets you custom-define safe zones, sends instant alerts when your pet leaves the safe zone, and allows for real-time tracking. LINK AKC smart collar is an award-winning GPS pet tracker that allows you to track your pet’s activity, location, health, and wellness. It works anywhere in the US within AT&T cellular coverage. Pod 3 is a GPS pet tracker that uses GPS, cellular, WiFi, and Bluetooth technologies for outdoor and indoor tracking. It works in 175+ world countries and has a virtually unlimited communication range. Waterproof & shockproof tracking unit weighing just 1.1 oz. Felcana is the only clinical-grade pet activity monitor in existence. It provides detailed and accurate activity data, allows for early detection of health issues, and monitors pet behavior. Marco Polo is a radio frequency pet tracking system that updates your pet’s location information every few seconds and boasts a 2-mile communication range. The device is accurate within inches. Paw Tracker is a GPS pet tracker that works in most of North America, updates your pet’s location every minute, lets you easily define the safe zone for your pal, and has an impressive battery life. 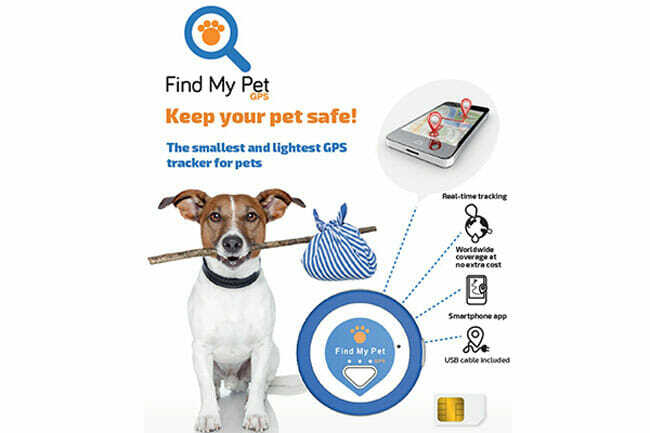 Find My Pet Nano GPS pet tracker works in 80+ world countries, refreshes location information every 60 seconds, provides instant alerts, and lets you custom-define the safe zones for your pet. A pet tracker is a device that uses one or multiple technologies to keep track of a pet’s location. Its main purpose is to prevent the pet from getting lost by providing regularly updated location information and timely alerts when the pet leaves the area within which he or she is safe. A pet tracker normally comes in the form of a tracking unit attached to the pet’s collar. The tracking unit communicates location information to the guardian’s smartphone or handheld device particularly designed for that purpose. Usually, pet trackers are used for keeping track of the location of a dog or a cat. However, there are some exceptions, including trackers that can be used for larger pets like horses. Pet trackers greatly differ in terms of shape, size, weight, communication range, accuracy, coverage, technology used to determine the pet’s location, technology used for transmitting location information, features, and price. What they all have in common is that their purpose is to allow you to know where your pet is at any given moment. Do I Need A Pet Tracker? We strongly believe in your right as a pet guardian to determine what is best for your pet. Thus, in this section of our guide, we will simply highlight the reasons why you may need to get a pet tracker and let you decide whether it is the right choice for you and your furry friend. First of all, the sad truth is that in the US alone, more than 10 million cats and dogs are lost or stolen every year, according to the estimates of the American Humane Association. Just about 40% of these pets get reunited with their guardians. Furthermore, if your pet gets lost, your chances of reuniting dramatically decrease over time. While microchipping can be of great help if your pet ends up in a shelter, only a pet tracker can help you make sure your best friend does not get lost in the first place. A pet tracker allows you to keep track of your pet’s location at all times and react in a timely manner if there is a chance that he or she may wander off too far. Not all pets are at the same risk of getting lost. A pet that never leaves your home and cannot walk out of the house or apartment without your knowledge is not highly likely to end up on the street. On the other hand, a pet that spends time in the outdoors is at a great risk of becoming lost, especially if he or she has the tendency to explore the environment independently, play with other pets, chase other animals or is simply free-spirited. Still, it should be noted that even if your pet never leaves the house, it does not mean that he or she would not seize the opportunity should it arise. Someone may leave the door open for a second, making it possible for your pet to walk out. This can be particularly dangerous as a pet that has never left your home may have difficulties finding his or her way back or staying safe outdoors. Thus, we can conclude that any pet can potentially get lost, which is backed up by the fact that 1 in 3 pets gets lost at some point during his or her lifetime. Although you can take extra measures to make sure this does not happen, the safest way to prevent your pet from becoming lost is to get a reliable pet tracker, as advised by numerous experts in the field of animal welfare. A pet tracker’s general mode of operation is quite simple. The tracking unit worn by the pet uses positioning technology to determine his or her location. Once the location information is obtained, it is transmitted to the guardian’s receiver or smartphone using communication technology. Different pet trackers use different technologies for determining the location and transferring the information. These include GPS, Bluetooth, radio frequency, cellular, and even proprietary technologies. The technology used determines the communication range of the device, as well as its coverage, accuracy, and general reliability. While the device constantly keeps track of the pet’s location, the freshly obtained information can be sent to the guardian’s receiver or smartphone at different intervals, which can be preset or custom defined. The information can be displayed on the screen of the receiver or it can be accessed via a smartphone using a dedicated app. The exact mode of operation and use differs across various pet tracker types. Just like pets, pet trackers come in different shapes and sizes. Currently in use are 3 major types, including radio frequency pet trackers, Bluetooth pet trackers, and GPS pet trackers, with GPS pet trackers coming in 2 different versions – cellular GPS trackers and mixed or multi-tech GPS trackers. Each pet tracker type relies on different technologies for tracking and has its advantages and shortcomings that are dictated by the technology employed. We will now explain how different types of pet trackers work and provide an overview of their greatest strengths and weaknesses. Radio frequency pet trackers consist of a module attached to the pet’s collar and a handheld radio transceiver that the guardian uses to locate the pet. The pet module and the transceiver communicate via radio frequency signals. The transceiver continuously requests the pet module’s location and the pet module emits a signal providing location information. The strength of the signal depends on the distance between the pet module and the transceiver, with the signal growing weaker with increased distance. Location information can be displayed on the transceiver screen in 2 ways, depending on whether the pet module possesses a GPS chip. If the pet module is equipped with a GPS chip, it provides coordinates that are displayed on a map on the transceiver screen. If the pet module does not possess a GPS chip, it provides location information in the form of direction and distance data. The main advantages of radio frequency trackers include long battery life and independence from cellular networks, which further means that there are no monthly charges. The communication range significantly varies depending on the brand, normally ranging from just around 400 feet to 2 miles. The main disadvantages of radio frequency trackers are that the pet modules are usually rather bulky and mainly suitable for large dog breeds and that you need to carry the transceiver with you instead of just using your smartphone like with other types of pet trackers. Bluetooth pet trackers consist of a tracking module attached to the pet’s collar. The pet module communicates location information to the guardian’s smartphone using Bluetooth technology. Location information is available in a dedicated app and includes distance and direction data. Bluetooth pet trackers often allow other users of the same tracker to receive location information about any pet wearing a tracker of the same brand, with the option to exchange data between different users. This can be considered both as an advantage and a downside, depending on whether you want third parties to receive your pet’s location information. The main advantages of Bluetooth pet trackers include suitability for pets of different sizes, low prices, good battery life, and independence from cellular networks. The main disadvantage of Bluetooth pet trackers is that their communication range is severely limited, usually ranging from fewer than 30 feet to just over 100 feet. Therefore, Bluetooth trackers are more useful for finding objects inside your house and they are not recommended for pet guardians whose pets may wander outside of the boundaries of their property. GPS pet trackers currently represent the most popular type of pet trackers. They normally consist of a tracking unit attached to the pet’s collar. The tracking unit communicates with the pet guardian’s smartphone via a dedicated app. The tracking unit is equipped with a GPS chip and establishes its location by connecting to GPS satellites, with no fewer than 4 satellites needed to successfully determine the location. Once the coordinates are established, they are sent to the pet guardian’s smartphone and usually displayed on a map available in the dedicated app. It is important to note that for GPS tracking to work effectively, the pet needs to be in the outdoors since concrete walls can prevent the tracking unit from establishing a connection with GPS satellites. That is why some GPS trackers are also Bluetooth and WiFi enabled, which allows them to determine and communicate the location of the pet even if he or she is in an enclosed space as long as there is a WiFi network or hotspot available or the pet is close enough to the guardian’s smartphone for a Bluetooth connection to be established. According to the technology used to transfer the data to the phone, GPS pet trackers can be divided into 2 sub-categories: cellular GPS pet trackers and multi-tech GPS pet trackers. Cellular GPS pet trackers rely on cellular networks to communicate location information to the pet guardian’s smartphone. This method of communication is efficient but has both advantages and drawbacks. The key advantages of cellular GPS pet trackers are that they can work anywhere within cellular coverage, often in multiple countries, and their communication range has no significant limitations, as they can work over any distance as long as there is a cellular network available. They are usually small, lightweight, and often suitable for both dogs and cats. The problem with cellular GPS pet trackers is that if you and/or your pet are in a remote area with no cellular coverage, the device will not work. Plus, due to the dependence on cellular networks, these pet trackers require you to purchase a service plan and pay monthly fees for the service. Multi-tech GPS pet trackers are not as common as cellular GPS pet trackers. They use GPS to establish the pet’s location but do not use cellular networks to communicate location information to the pet guardian’s smartphone. Instead, they normally use independent proprietary technologies that allow for the transfer of location information virtually anywhere, even in the most remote areas of the globe. The major advantage of multi-tech GPS pet trackers is their independence from cellular networks, which allows for unlimited coverage. Thus, you can use them anywhere and everywhere. Like cellular GPS pet trackers, they are usually small, lightweight, and suitable for dogs and cats of different sizes. The main disadvantage of multi-tech GPS pet trackers is that they cannot work over any distance. However, they often boast an impressive communication range of three or more miles and with a high accuracy and instant notifications sent when your pet wanders away, they allow you to efficiently locate your pet in very little time. The range of features available hugely depends on both the type of pet tracker you choose and the brand you opt for. However, in order for a pet tracker to be a genuinely helpful tool, it needs to possess 5 key tracking features, including real-time tracking, instant alerts, geofences, location history, and sharing or interconnectivity. The problem is that nearly every manufacturer claims that its device possesses these features and uses these terms loosely for marketing purposes. We will now explain what these features should actually entail and warn you about potential manipulations you need to be aware of. This is the term that is most loosely used in the world of pet tracking. Many pet trackers monitor pets’ location in real time but do not allow for true real-time tracking because the location information available to the guardian is not updated frequently enough. While you can successfully locate your pet as long as the update interval is not much greater than 60 seconds, pet trackers that allow for true real-time tracking update location information every couple of seconds. Geofences allow you to set safe zones for your pet. You can define an area within which your pet can safely run and play, usually within the boundaries of your property. With some pet trackers, the safe zones are automatically set. With others, you can change the location and dimensions of the safe zone. Certain top-of-the-line pet trackers do not only allow you to set safe zones but also let you define danger zones, areas your pet should not enter. Geofencing is highly useful as it allows your pet tracker to know where your pet can safely move, so it could inform you in case of undesired changes in your pet’s location. Another feature that decisively influences the success of your search is the availability of instant alerts. Some pet trackers provide delayed notifications while the best pet trackers provide notifications as soon as your pet leaves the safe zone. That way, they allow you to react immediately and maximize your chances of locating your pet quickly and easily. Some of the top pet trackers also provide instant alerts in case of suspicious changes in your pet’s movement, such as a dramatic increase in speed. The best pet trackers allow you to view your pet’s location history. This lets you revisit past walks and gain insight into your pet’s latest route. Different pet trackers provide location history in different forms and timeframe options. Some store location history for a whole year, others just store the most recent location information. The information available differs as well and may not only include direction and distance walked but also some additional data, such as speed. You may not always be around to personally locate your pet. The sharing feature allows you to let your friends and family gain insight into your pet’s whereabouts, so they can search for your pal themselves using the information provided or join you in your search. This feature can also allow you to remotely track your pet if you are using a non-cellular pet-tracker. The sharing method differs among pet trackers, with some allowing full insight into location information and others allowing you to simply share important alerts with authorized individuals. How Accurate Are Pet Trackers? As there are several different types of pet trackers, it is to be expected that they greatly differ in terms of accuracy. Usually, accuracy is in a negative correlation with the distance over which the tracker can work. If the tracker can locate a pet that is far away, its accuracy may not be as high as with a tracker that is used for close-range tracking. That being said, you can opt for a pet tracker that can track your pet within just an inch, which is the case with a small number of close-range radio frequency trackers. On the other hand, there are trackers that work over great distances – but with a precision that may be more than 50 feet. For GPS trackers, the average is about 25 feet in favorable conditions. When speaking about pet tracker accuracy, it is important to point out three key facts. First of all, regardless of which technology they use, there is no such thing as a 100% accurate tracker. Second, a single pet tracker’s accuracy greatly varies depending on conditions and surroundings. For example, a GPS tracker can be incredibly accurate in open spaces with a clear line to the sky and its accuracy can be significantly diminished in crowded urban areas. Third, it is not a good idea to sacrifice a great communication range for the sake of high precision, unless you need help finding a small cat that has the habit of hiding in completely random places within your home. Trackers used to locate small objects within a home, such as car keys, should boast exceptionally high precision. On the other hand, keeping in mind that cats and dogs are not as small as car keys, pet trackers do not have to be extraordinarily accurate in order to allow you to easily locate your pet. To conclude, the accuracy of pet trackers ranges from a mere inch to over 50 feet, with close-range trackers boasting a higher accuracy than those with a greater communication range. However, you should keep in mind that in order to successfully locate your pet, you do not need 100% accurate location information, so as long as the tracker’s average error is not much greater than 25 feet in optimal conditions, there is no need to worry. Pet trackers are on-collar devices that are normally not in direct contact with your pet, as they are simply attached to the collar. Thus, there is no need to worry about potential irritations and similar unpleasant sensations caused by the pet tracker. Some pet trackers come with collars included, which eliminates the possibility of the tracker not fitting the pet’s existing collar. These collars are usually comfortable and made of safe, high-quality materials. However, even though pet trackers cannot cause any irritations and similar discomfort, there is always the matter of the size and weight of the tracker and its suitability for pets of different sizes. There are trackers that are too bulky to be suitable for cats and small dog breeds, as their weight and size may cause neck discomfort. Responsible manufacturers of pet trackers always indicate the size and weight of the trackers as well as the recommended pet size. That way, they allow pet guardians to find out in advance if the pet tracker in question is a good fit for their pet. There are pet trackers that are specifically designed for cats and small dog breeds and the majority of trackers are suitable for pets weighing upwards of 5-10 pounds, with some exceptions. In short, pet trackers are generally comfortable and unobtrusive and they are often quite small and lightweight. However, it is important to be aware that not all trackers are suitable for all pets. Do I Need A Pet Tracker If My Pet Is Microchipped? In order to understand why you need a pet tracker even if your pet is microchipped, it is necessary to recognize one essential difference between a pet tracker and a microchip. Namely, a microchip is used to locate the guardian of a lost pet while a pet tracker is used to locate the pet. Let us elaborate on this. Microchipping is required by law in a number of world countries and it is applied as a means of reducing the number of lost pets that end up in animal shelters – or even worse, the streets. If a lost pet is found by a third party or brought to an animal shelter, it is easy to identify the pet’s guardian if the pet is microchipped. A licensed individual, such as a vet, simply needs to enter the 15-digit ID number on the microchip in order to identify and locate the guardian of the pet. Thus, a microchip facilitates the reconnection between a lost pet and his or her owner as it makes it possible to identify the guardian of a pet that has already been found by someone. However, it is of no use if the pet has not been located by an individual who could then bring the pet to an individual who can read the microchip. Simply put, it does not track your pet but helps others who find your pet locate you as the guardian. In contrast to microchips, pet trackers are designed to monitor your pet’s location at all times and allow you to efficiently track and locate your pet by providing location updates at short intervals of time. They let you know where your pet is at any given moment, they can notify you when your pet leaves the safe zone such as your backyard, and most importantly, they allow you to make sure your pet does not get lost. We can conclude that microchips are more than useful if a lost pet is found by a third party, but they cannot prevent your pet from getting lost. On the other hand, a pet tracker is an indispensable assistant that keeps an eye on your pet 24/7, provides exact information on your pet’s location, and notifies you if you should search for your pet in order to prevent him or her from wandering away too far. In other words, both microchips and pet trackers are valuable pieces of technology, but they cannot be used interchangeably as they perform two quite opposite functions. Do I Need A Pet Tracker For My Cat? According to the American Society for the Prevention of Cruelty to Animals (ASPCA), about 3.4 million cats end up in shelters every year and 1.4 million of them get euthanized. The number of lost cats is significantly greater than the number of cats that end up in shelters since cats tend to hide in silence when they are on unfamiliar grounds, they do not trust and rarely approach strangers, and even if they are noticed, they are often considered to be stray cats. Thus, people rarely attempt to reunite them with their guardians since they assume they do not have one. On top of that, cats are much less likely to wear identification collars and less than 25% of them are microchipped, which makes it nearly impossible to identify their guardians, even if they end up in shelters. As a result of all these unfortunate factors, just about 2-3% of lost cats are reunited with their guardians, according to a 2012 study published in Animals, an open-access journal of animal science and animal welfare. Thus, if your cat gets lost and is not wearing a pet tracker, the chances of finding him or her are incredibly low, even if microchipped, due to cats’ natural behavior and the general public’s attitude toward cats encountered on the street. Regardless of whether your cat has the habit of wandering off on his or her own, it is important to remember that cats are naturally curious and free-spirited creatures. It is impossible to know when something may attract your cat’s attention and make him or her decide to go on an adventure away from home. With millions of them lost every year in the US alone and so many of them never reunited with their guardians, the need for the use of pet trackers in cats is more than obvious. Even if your cat has never disappeared before, there are no guarantees that it may not happen at some point during his or her lifetime. Considering the extremely low chances of reconnecting if your cat gets lost, the conclusion is simple – if you love your cat and care about his or her safety and well-being, you should definitely consider getting a pet tracker. Now that you know what to look for in a pet tracker and how to discover whether a certain pet tracker suits your needs, it is time to take a closer look at our top picks. We have selected the most reliable and efficient pet trackers currently on the market by assessing their performance in real-world tests in accordance with our strict and objective criteria. Read the mini-reviews of the best pet trackers available below and discover which of them is the best choice for you and your furry friend. Findster Duo+ is a GPS pet tracker that belongs to the subtype of mixed or multi-tech GPS pet trackers. It is independent of cellular networks, which is why it does not come with monthly fees – you only pay for the device. The tracker consists of 2 modules – the pet module and the guardian module. The pet module obtains location information via GPS and sends the information to the guardian module using Findster’s proprietary MAZE technology. The information is sent to the guardian’s smartphone via Bluetooth and made available in the dedicated Findster app. Findster Duo+ pet module is small and lightweight, measuring 2.1’’ x 2’’ x 0.5’’ and weighing just 1.76 ounces, which makes it suitable even for smaller dogs and cats. It can be attached to virtually any collar using the clasp-like collar strap attachment mechanism. The device is shockproof and waterproof, withstanding immersion of up to 3 feet. It is equipped with a LED light that facilitates tracking in the dark. Its battery lasts for up to 5 days or 12 hours in active search mode. The communication range of Findster Duo+ is about 3 miles but can be up to 5 miles in open spaces. The device boasts worldwide coverage and works even in the most remote areas of the globe. It is highly precise, with an average error of 5-10 feet and it allows for real-time tracking, with instantly updated location information. Findster Duo+ provides key tracking features including instant alerts, location history, a built-in radar, 3 types of geofences (virtual leash around your location, safe zone, and danger zone), and interconnectivity. It also allows for pet activity tracking, with information about rest time, distance walked, and calories burned, as well as useful activity notifications and fun features like badges and leaderboards that allow you compete against other Findster Duo+ users. The device comes with a 30-day money-back guarantee and 1-year warranty. Garmin Astro 430 is an advanced dog tracking system that lets you track up to 20 dogs at once with zero monthly fees. It consists of a handheld locator and 1+ tracking unit with a collar included. It uses GPS and GLONASS for location tracking and relies on radio frequency signals for inter-device communication. Both the locator and the tracking unit are rugged and waterproof and designed to withstand bumps, blows, splashes, rain, snow, and other kinds of harsh conditions. The tracking unit comes in 2 versions, T5 and T5 mini. T5 weighs 9.3 oz. with the collar and fits neck circumferences of 9.5+ inches while T5 mini weighs 7 oz. with the collar and fits neck circumferences smaller than 9.5 inches. The locator has a battery life of up to 20 hours, the T5 tracking unit has a battery life of 20-40 hours, and T5 mini’s battery can last for 16-30 hours. The tracking units are equipped with LED beacons and the locator comes with a vibration motor. Garmin Astro 430 has a communication range of up to 9 miles, it is accurate within no more than 12 feet, and it provides location updates every 2.5 seconds. It does not have a limited coverage, but it can only be used in the US for legal reasons. Its incredibly vast set of features includes, among others, near-real-time tracking, additional maps, hunt metrics, a convey counter, trip planning with BaseCamp software, computer tracking with BaseStation software, numerous search profiles, a customizable dog display, multiple dashboards, wireless sharing, battery saving in the Rescue Mode, and plenty of bonus tools. Garmin Astro 430 comes with a 30-day money-back guarantee, a 1-year limited warranty, and a free 1-year subscription to BirdsEye Satellite Imagery. Whistle is a cellular GPS pet tracker that offers both location tracking and activity monitoring features. It consists of a tracking unit attached to the pet’s collar or harness and comes with a dedicated Android and iOS smartphone app available free of charge. The tracker uses GPS for active tracking. It sends location information to the pet guardian’s smartphone via cellular technology and employs WiFi to create safe zones. Bluetooth is used to pair the tracking unit with the pet guardian’s smartphone. The tracking unit measures 1.82’’ x 1.45’’ x 0.61’’ and weighs only 0.92 ounces (1.25 ounces with the attachment strap). It is suitable for dogs and cats weighing 8 pounds and more. It can withstand submersion in water of up to 3 feet for up to 30 minutes and it is IP67 dirt and shock resistant. It comes with a rechargeable battery that lasts up to 7 days. Whistle can be purchased and used in the US. It works over any distance within AT&T cellular coverage. With active tracking, location information is updated every 60 seconds. You can expect a notification about your pet leaving the safe zone within 1-6 minutes. The tracker is normally accurate within 10-15 feet. Whistle allows you to view your pet’s current location on a Google map, view 24-hour location history, access 24-hour activity history, custom-define multiple safe zones, custom-define your pet’s daily activity goals, receive text, email, and push notifications, and share access to your pet’s information with friends and family. The device comes with a 90-day money-back guarantee. Tractive GPS is a cellular GPS tracker for dogs and cats that comes in the form of a tracking unit attached to your pet’s collar. The device obtains location information using GPS and sends the data to the dedicated Tractive app that you can access on any device. Tractive GPS is available in 3 attractively designed versions. It measures just 2’’ x 16’’ x 0.6’’ and weighs a mere 1.23 ounces. It is suitable for dogs and cats weighing 9.9+ pounds. It is shockproof and waterproof, withstanding immersion of up to 3 feet for up to 30 minutes. Its average battery life is 2-5 days with normal use and 8 hours in live tracking mode. It is equipped with a LED light and a built-in speaker that emits a buzzer-like sound, but it should be noted that the buzzer feature is not available in the US due to legal restrictions. The device is functional anywhere within cellular coverage and works in more than 150 world countries. Its average accuracy is 25 feet, with a confidence level of 95%. It allows for real-time tracking, with location information updated every 2-3 seconds. Tractive GPS provides an excellent interactive map that allows you to switch between multiple views, including augmented reality. It provides speed, altitude, and battery level information, location history, customizable safe zones, and tracker sharing. The device comes with a 12-month guarantee and free replacements during the service period. LINK AKC smart collar is a GPS pet tracker that relies on AT&T cellular network. It consists of a tracking unit attached to the pet’s collar and a base station to be placed in your home. It uses Bluetooth to establish your pet’s location when in the safe zone and GPS and cellular networks to obtain location information and send it to your smartphone when your pet roams outside the safe zone. Location information is available in the dedicated LINK AKC app. The tracking unit measures 1.5’’ x 3.9’’ x 0.5’’ and weighs 2.55 ounces together with the carrier used to attach it to your pet’s collar. The device comes with a collar included and the collar comes in 3 sizes. It is suitable for dogs and cats weighing 10+ pounds. The device is shockproof and waterproof, withstanding immersion of up to 3 feet. Battery life is 3 days with normal use. It is equipped with a night light and remotely activated built-in speaker for sound training. LINK AKC works over any distance within AT&T cellular coverage. Its coverage is limited to the US. Its accuracy is about 25 feet and it offers near-instant notifications, provides the first location within minutes, and updates location information within seconds. The device provides automatically established safe zones around the base station and your smartphone, with the smartphone safe zone being customizable. Additional features include smart activity tracking with a 3-axis accelerometer, personalized activity recommendations, vet records, temperature monitoring, and virtual scrapbooks. The device comes with a 1-year size guarantee, 90-day money-back guarantee, and 3-year warranty. Pod 3 is a GPS pet tracker that relies on GPS for outdoor tracking and employs WiFi and Bluetooth technologies for tracking indoors. It uses 2G and 3G cellular networks for communication between the tracking unit and the guardian’s smartphone. The device comes with smartphone apps for Android and iOS and a web app that can be accessed via a computer and mobile browsers. Pod 3 comes in the form of a cylinder-shaped tracking unit measuring 2’’ in length and 0.9’’ in diameter. It weighs just 1.1 ounces, which makes it suitable for small and large pets alike. It is resistant to impact and boasts an IPX7 waterproof rating, meaning it can withstand immersion in water of up to 3 feet for up to 30 minutes. It is equipped with a night light and comes with 2 interchangeable, rechargeable batteries that can last for up to 5 days in standby mode and up to 8 hours with the minimum location update interval of 10 seconds. The device can work over any distance within cellular and WiFi coverage and it is accurate within 10-90 feet, depending on the location method. It works in more than 175 countries on 6 continents. Pod 3 allows you to define multiple safe zones for your pet, instantly notifies you when your pet leaves the safe zone, provides activity and movement monitoring features, and allows you to record your pet’s adventures and revisit them later. The device comes with a 30-day money-back guarantee and a 12-month warranty. Felcana is a smart pet activity monitor that provides clinical-grade activity data. It consists of a smart activity-tracking device attached to the pet’s collar, micro-location beacons that monitor pet behavior, and the home hub that extends the smart device’s range and serves as a charger and a data nest. The smart wearable device communicates with your smartphone via Bluetooth 5.0 and it uses long-range <1GHz radio technology to communicate with the home hub. Micro-location beacons are Bluetooth enabled and the home hub is WiFi enabled. Small and light enough to be worn by cats and dogs of all sizes, the wearable device measures 1.8 inches by 0.6 inches by 0.4 inches (LWH) and weighs just 0.3 ounces (9 grams). It comes with an attachment strap and features a night light. Felcana can work all over the globe. The wearable device can communicate with your smartphone over a distance of up to 220 yards (200 meters). It can communicate with the home hub within a range of up to 1,300 yards (1,200 meters). The wearable device uses a rechargeable battery that can last up to 14 days on a single charge, while the micro-location beacons come with disposable batteries that last up to 18 months. The key features of Felcana include accurate activity monitoring including intensity, duration and frequency data, daily, weekly, and monthly activity reports, behavior monitoring including information on eating, drinking, sleeping, and toilet habits, assistance in early detection of health issues, separation anxiety detection, abnormal activity alerts, and ambient temperature monitoring. Felcana comes with a 14-day money-back guarantee and a 1-year warranty. Marco Polo advanced pet tracking system belongs to the category of radio frequency pet trackers. It consists of a handheld locator and a small and light tracking tag attached to the pet’s collar. The system exclusively relies on radio frequency signals, meaning it does not depend on any external services, which allows it to work anywhere on the globe, with no monthly fees. The tracking tag measures 1’’ in height by 5’’ in width by 0.5’’ in depth. It weighs only 0.8 ounces, which makes it suitable for most dogs and cats. It can fit any collar up to 2 inches wide and 0.25 inches thick. The tag is shockproof and can withstand submersion in water of up to 3 feet for up to 30 minutes. The battery can last for up to 45 days with minimum use and 3 days in the live tracking mode. 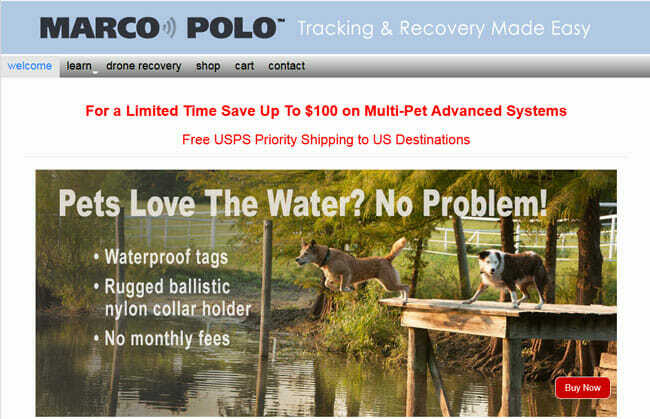 Marco Polo pet tracking system boasts worldwide coverage and a 2-mile communication range. During live tracking, it updates location information every few seconds. It allows you to choose from 4 preset safe zone radiuses, including 50-feet, 100-feet, 300-feet, and maximum-range radius. Since it relies on radio frequency signals, it allows for both indoor and outdoor tracking. The device comes with a 30-day money-back guarantee and a 90-day warranty. Paw Tracker is a GPS pet tracker in the form of a tracking unit that can be attached to your pet’s collar or harness. It uses GPS and WiFi technologies to establish your pet’s location in the outdoors and indoors and employs cellular technology to send location information to the dedicated Paw Tracker app that you can access on virtually any smartphone. The tracking unit measures 47 mm x 50 mm x 14 mm and weighs a mere 1.41 ounces. It can be attached to collars and harnesses up to 1’’ wide and 0.25’’ thick. It is suitable for cats and dogs weighing 5+ pounds. The device is shockproof and waterproof and features a night light. Its battery life can range between 12 hours and 10 days, depending on how often location information is updated. Paw Tracker can work over any distance within cellular and WiFi coverage. It works in most parts of North America, including the US, Canada, and Mexico. Its accuracy is about 25 feet and location information can be updated every 1 minute, 10 minutes, 60 minutes or 12 hours, depending on your preferences and circumstances. Paw Tracker offers an interactive map that allows you to switch between different views, provides location history, customizable safe zones, and low battery alerts, and allows you to share your pet’s location information with family and friends. Find My Pet Nano is a GPS pet tracker in the form of a tracking unit attached to your pet’s collar. It uses GPS to track your pet’s location, GSM (2G) cellular network to send information to your smartphone, and WiFi and Bluetooth technologies to enable tracking indoors. Location information is available in the dedicated Find My Pet Nano app. The tracking unit is round, measures 1.4’’ in diameter, and weighs just 0.7 ounces, which makes it one of the smallest and lightest pet trackers in the world. It is suitable for dogs and cats weighing 8+ pounds. It is shockproof and waterproof, comes with a night light, and has a built-in speaker, but the speaker is not suitable for sound training. Battery life is up to 96 hours with normal use and up to 12 hours in live tracking mode. The device functions over any distance within cellular or WiFi coverage. It works in 80+ world countries, including the US. It is accurate within 10-30 feet and it can update location information every 1-120 minutes, depending on your preferences. Find My Pet Nano offers fully customizable safe zones, location history, speed limit, low battery, and SOS alarm, as well as the option to send email and text alerts to up to 10 contacts. The device comes with a 100% guarantee and warranty, with exact information on guarantee and warranty period and limitation obtainable from customer service. In order to pick the right pet tracker, you first need to know what kind of features a pet tracker can, need, and should possess. We have already pointed to the key tracking features every good pet tracker must offer. In this section, we will highlight all the characteristics you should pay attention to when choosing the best pet tracker for your furry friend. Starting with the physical characteristics, we need to emphasize once again that size and weight matter immensely. Check the dimensions of the tracker, its weight, and recommended pet sizes before examining any further features. Even if the tracker in question is one of the best pet trackers on the market, it does not make any difference if it is too heavy or too large for your pet to wear it comfortably. Every pet should enjoy an active lifestyle with plenty of adventures. Whether your pet likes to play with other animals, roll on the grass, jump, swim or dance in the rain, a pet tracker should be able to follow him or her at all times. The best pet trackers are resistant to both water and impact, so they can work properly for a long time (at least a couple of years), regardless of the conditions and your pet’s level of activity. Keep in mind that there are different waterproof ratings. We recommend purchasing a pet tracker with IP67 rating, which allows it to withstand immersion of up to 3 feet. It is impossible to overemphasize the importance of a pet tracker’s battery life. If your pet tracker’s battery cannot last very long, it is highly likely that it may die mid-tracking, rendering the device useless. Some pet trackers use disposable batteries, others use rechargeable batteries, with battery life ranging from just a couple of hours to several weeks and even longer. Generally speaking, battery life highly depends on tracker type and use, but what is important is to choose a pet tracker that can last for at least 6 hours in tracking mode, with short location update intervals. Although it may not seem like a huge deal, night light can be of invaluable help if you are searching for your pet after dusk. The best pet trackers come equipped with a LED light that can guide you when you are looking for your pet in the dark and also provide useful information about the device, including its battery level and availability of GPS and cellular networks. Sometimes, you cannot start searching for your pet right away or your pet may be moving at a great speed (e.g. when chasing other animals), which is why it is important for your pet tracker to have a great communication range. If the range is too small, you may lose connection to the tracker quickly and thus be unable to locate your pet. The optimal range is dictated by your surroundings, but be aware that pet trackers differ immensely in this respect and bigger is always better. No pet tracker is 100% accurate – and accuracy heavily depends on the conditions. However, it is important for the tracker to provide accuracy of about 25 feet in perfect conditions, so if its accuracy is diminished due to the surroundings and location, it can still provide location information that is precise enough to bring you within a seeing distance from your pet. Many pet tracker manufacturers claim that their devices allow for real-time tracking, but this is rarely true. The best pet trackers update your pet’s location information every couple of seconds and you should not settle for an update interval greater than 1 minute. Some pet trackers only work in certain areas of one country, others boast worldwide coverage. No matter where you live and how often you travel, it is important to acquaint yourself with the pet tracker’s coverage, so you can know whether it works in your area and whether it can be of use in other parts of your country or abroad. Quite often, pet trackers do not allow you to track your pet both in the outdoors and indoors. This is often the case with GPS trackers that cannot establish a connection with GPS satellites without a clear line to the sky. It is always best to choose a pet tracker that can work even if your pet wanders into an enclosed space. Bluetooth and WiFi enabled GPS pet trackers are a perfect example of devices that allow for both indoor and outdoor tracking. Safe zones make tracking much easier and less stressful, as they allow you not to get alerted if your pet is still in the area in which he or she can freely move without any danger of getting lost or harmed. However, it is also important to be able to custom-define and modify the safe zone, so you can adjust the boundaries and location at any time, whether because you are traveling or because you discovered that the safe zone should be smaller or larger than the one originally defined. The best pet trackers notify you as soon as your pet leaves the defined safe zone. If notifications are delayed, even by minutes, you are losing precious time you could spend actively searching for your pet. If a tracker does not offer instant alerts, it is probably not worth your money. The top pet trackers almost always allow you to view your pet’s past locations. This can be of use if you want to trace your pet’s route in case you lose connection with the device, so you could get a sense of where he or she is headed but also to better understand your pet’s movement habits. We would like to emphasize that activity monitoring is not an essential characteristic of a pet tracker. However, it is good to know that some of the best pet trackers keep track of your pet’s location as well as activity, allowing you not only to keep your best pal safe but healthy as well. Thus, although a pet tracker does not have to monitor your pet’s activity, you should be aware of the fact that you can get a pet tracker that performs this function too, so you practically get 2 devices in 1. Another non-essential characteristic that can be of great value is sound-based training. Some of the best pet trackers come with built-in speakers that can be remotely activated. You can use this functionality to train your pet not to overstep the boundaries of your property. Most pets quickly learn the meaning of the sound, so this can be of immense help in preventing your pet from getting lost. If you are paying for a pet tracker, you might as well get everything you can for your money. Although there are excellent pet trackers whose feature set is limited to location tracking features, you can also get a tracker that can help you manage vet records, monitor ambient temperature so you know if it is too hot or too cold for your pet, create virtual scrapbooks that allow you to revisit your past walks with your pet, compete with other users of the same device by reaching activity milestones, which can encourage you and your pet to be more active, and much more. When searching for your pet, you may need assistance, whether because you are not close to your pet or because you cannot begin the search immediately. In those cases, the possibility to share your pet’s location information with friends and family can be of great help, which is why it is wise to choose a pet tracker that offers this handy option. A pet tracker can cost anywhere between a couple of bucks and upwards of $100. On top of that, some pet trackers come with monthly fees (e.g. cellular GPS trackers), which increases the total cost. Although it is hard to define the optimal price, as the price is in strong correlation with the quality, it is crucial to factor in all the potential additional costs, including but not limited to monthly and shipping fees. 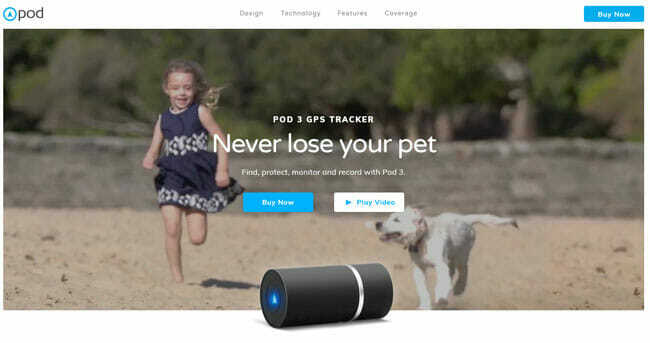 The pet tracker you purchase may not be a good fit for your pet, it may get lost or damaged, it may suddenly stop working or it may simply not be as good as you expected it to be. For all these reasons, it is important to choose a pet tracker that comes with a money-back guarantee, so you can test it out and see if it actually works well. The tracker of your choice should optimally come with a warranty, so you do not have to worry about any malfunctions that may arise. Plus, if the device comes with both a money-back guarantee and a warranty, it is a good sign that you are dealing with a manufacturer you can trust.